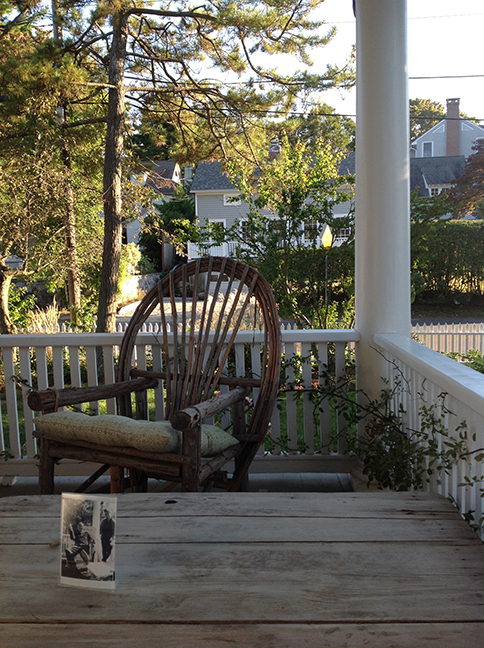 Upstairs at 74 Rowayton Ave., standing in the front bedroom, I thought: this is where Maurice Sendak stayed, when he came up from New York City on the weekends, to work on Ruth’s books. 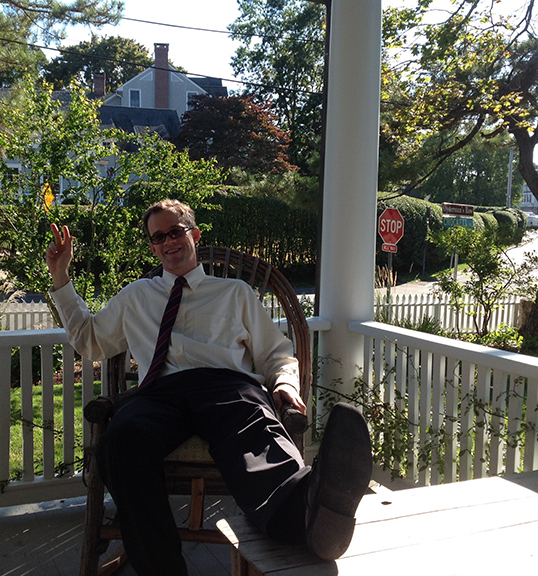 Downstairs, I sat out on the front porch where, in 1951 and 1952, he and Ruth worked on A Hole Is to Dig — and Dave (a.k.a. Crockett Johnson) refereed. Thanks to Nina Stagakis’ sketch (drawn from memory) of the first-floor layout, I could see exactly where, in the front room, sixty years ago, Dave sat while he created dummies for Harold and the Purple Crayon, and noticed that he could easily have looked over his shoulder and seen eight-year-old Nina, at her desk, drawing. When she was eight, her father died. She and her mother Phyllis Rowand — who were already friends and neighbors — grew even closer to Dave and Ruth. Dave built her a Nina-sized desk, and put it in his office, allowing her to draw at her desk while he drew at his. Shortly after, Dave began working on Harold and the Purple Crayon. Crockett Johnson’s desk was here, 1945-1973. 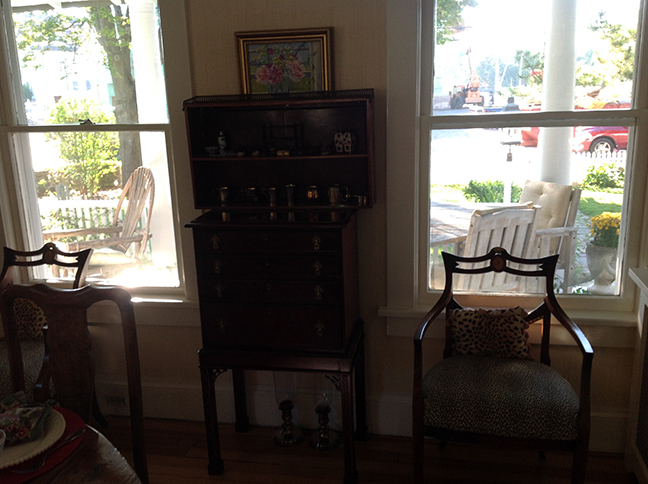 Desk of Nina Rowand Wallace (now Stagakis) was here; from vantage point of Crockett Johnson’s desk. Nina Rowand Wallace’s desk was here in 1954. 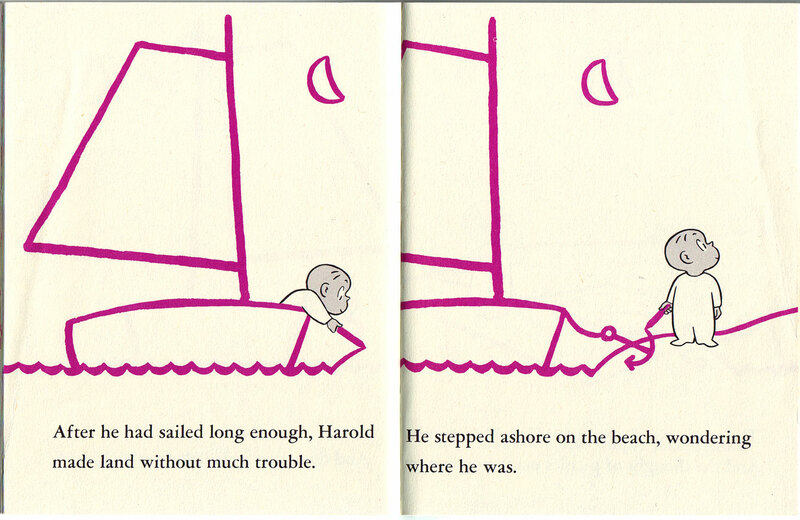 While drawing Harold and the Purple Crayon, if Dave looked up from his desk and out the front window, he faced not only water (a key plot element in the book), but boats (another key element). I don’t know how much of Harold he created during daylight hours (like Harold himself, Dave often worked at night), but the windows of his office looked out onto the Five Mile River, where he docked his own boat. Today, construction partially obscures the view, but in 1954 he had a clear sight line. The house is and is not as it was. The kitchen is now open to the adjacent room. What was Dave’s office is now the dining room, and what was dining room is now the living room. The third floor is now finished, and would be an ideal studio for Dave. The basement — where he painted — still floods in a storm, although perhaps less than it once did (the walls have been painted with sealant). When it does flood, Gil told me, water shoots out from the front wall. The basement ceiling is also a little low for a man who was nearly six feet tall. (Dave’s head would have cleared the ceiling by about six inches.) 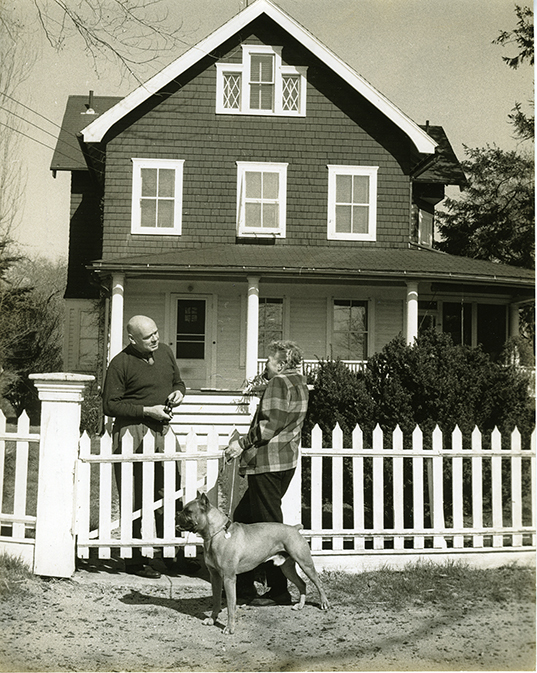 I see why, in 1973, Dave and Ruth moved to their Westport home, where he could paint in a studio above the garage. 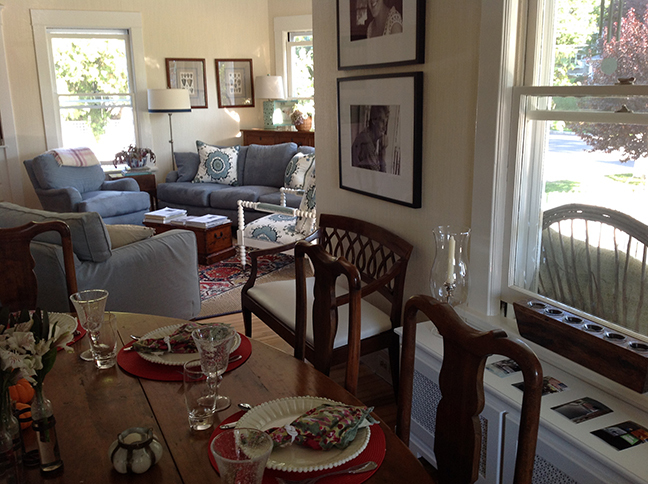 I also see why Ruth and Dave chose 74 Rowayton Ave. It’s cozy. Not unlike the house in which I currently live, you can stand in the living room, and look out windows on all four sides of the house. Its many windows bring in lots of light. 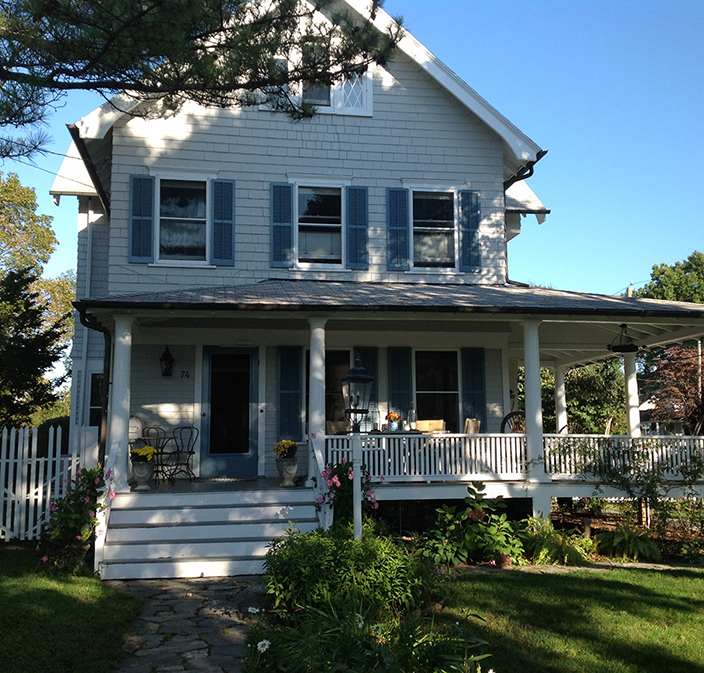 Sitting on the porch or one of the front rooms, you can look out at the Five Mile River. 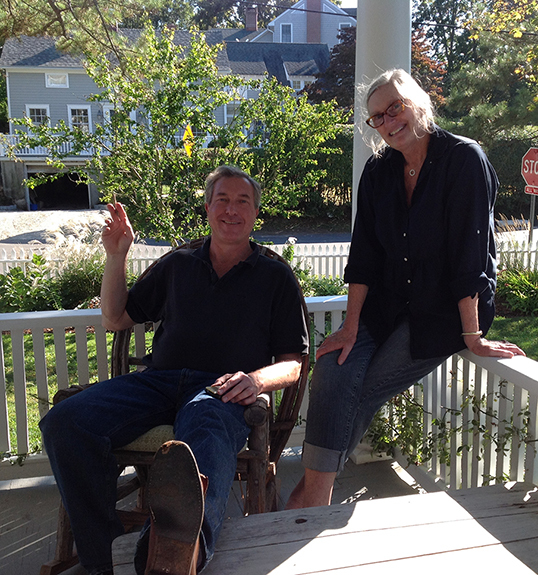 Jackie Curtis — a photographer and friend of Dave and Ruth’s, who was also there on Friday — mentioned that Dave enjoyed sitting out on the porch, drinking a martini. 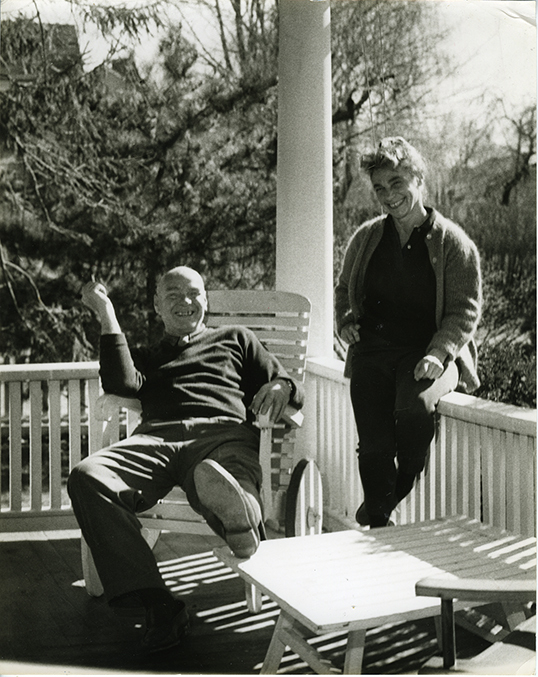 Crockett Johnson and Ruth Krauss, 1959; Gil and Kim Kernan, 2014. 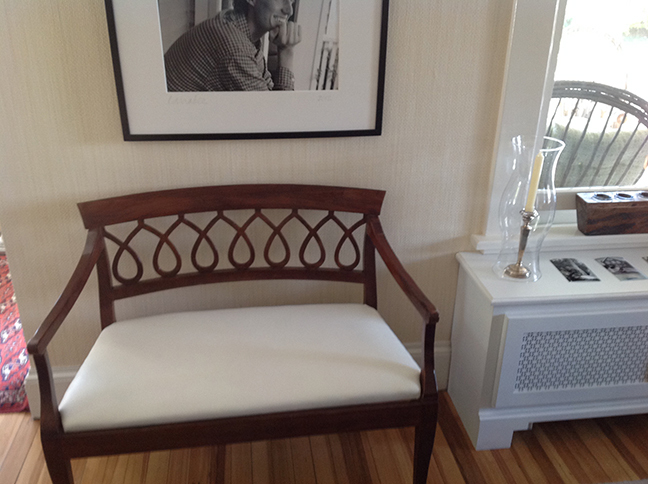 Yours truly, 2014; absence, 2014 (with 1959 photo on table). 74 Rowayton Ave is a private home. So, don’t go knocking on the door expecting Gil and Kim to let you in. 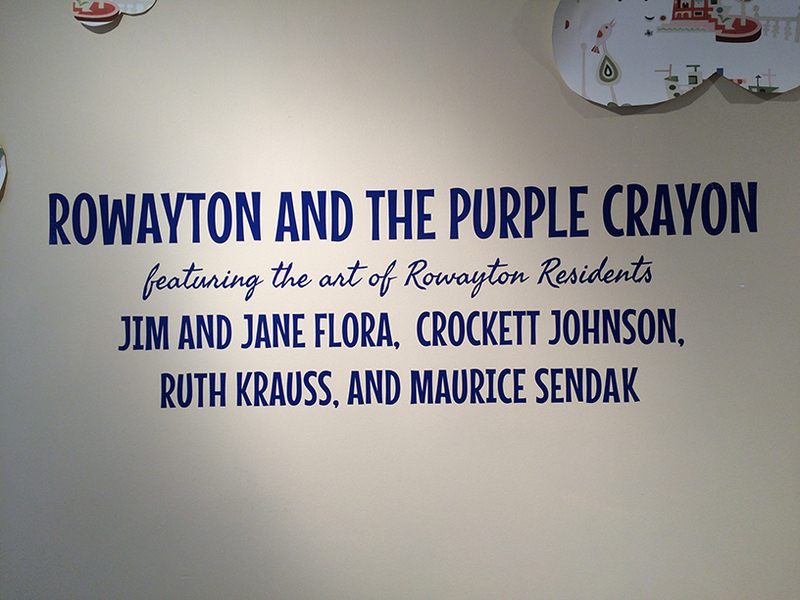 Do, however, swing by the Rowayton Historical Society (177 Rowayton Ave., just down the street from the Johnson-Krauss house) and check out Rowayton and the Purple Crayon, an exhibit devoted to the “Creative Culture of 1950s Rowayton” — Johnson, Krauss, Sendak, Jim and Jane Flora. It runs through the end of November. It’s lovingly curated, child-friendly, and it taught me a few things I didn’t know. According to Jim Flora, Alexander Kerensky lived in Rowayton in the 1940s. I knew that several left-leaning folks moved to Norwalk (Rowayton is South Norwalk) during that time — including Johnson, Krauss, and George Seldes. But I’d never heard about Kerensky (Prime Minister of Russia’s provisional government, in 1917). Also, I saw this great photo, taken at a 1958 Rowayton Public Library event celebrating National Library Week. Back row: Fred Schwed Jr. (author of Where Are the Customers’ Yachts? 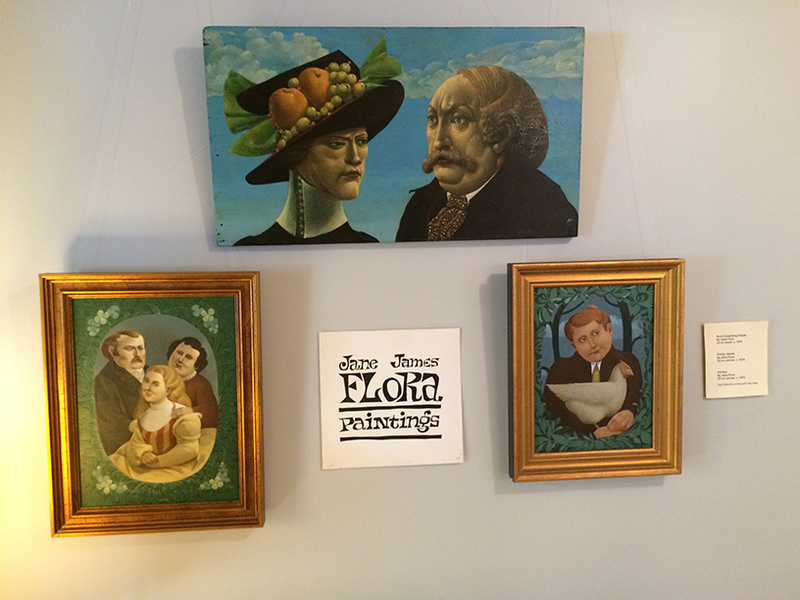 ), unknown person #1, John Sharnick (journalist, TV producer), Leonard Gross (author of God and Freud), Crockett Johnson, unknown person #2, Jim Flora (creator of children’s books and album covers). 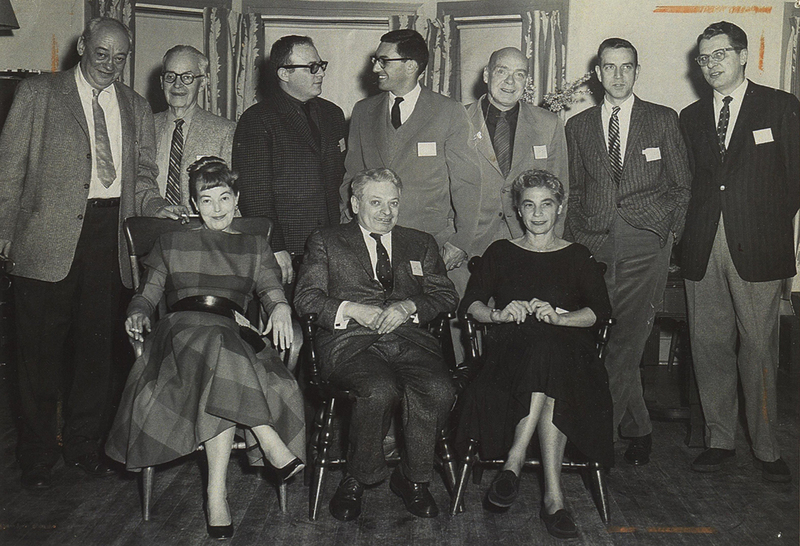 Front row, left to right: Phyllis Rowand (artist, illustrated some of Ruth Krauss’s books), Carl Rose (cartoonist for New Yorker & others), Ruth Krauss. If you have any guesses as to who the other two people might be, please let me know. 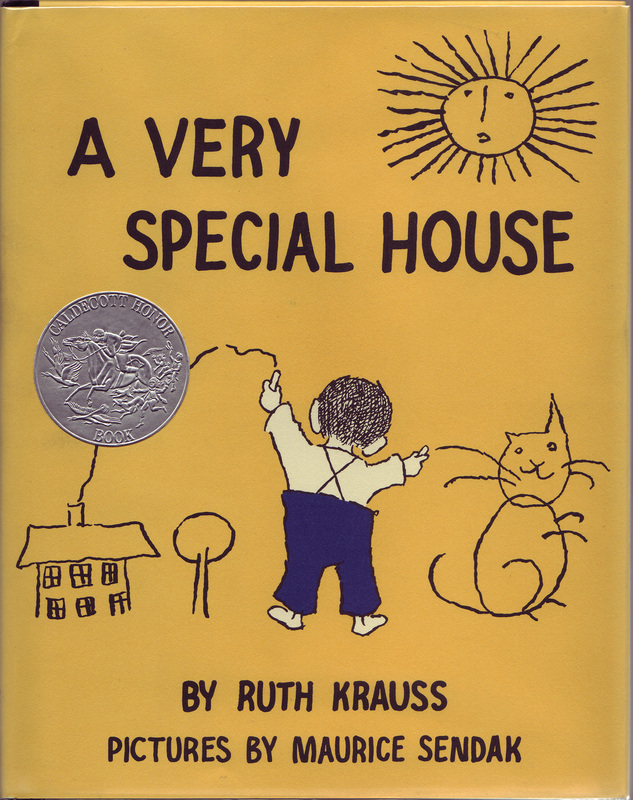 Crockett Johnson, Ruth Krauss, Jim and Jane Flora, Maurice Sendak, Phyllis Rowand, Fred Schwed, Carl Rose, and all the rest are gone. 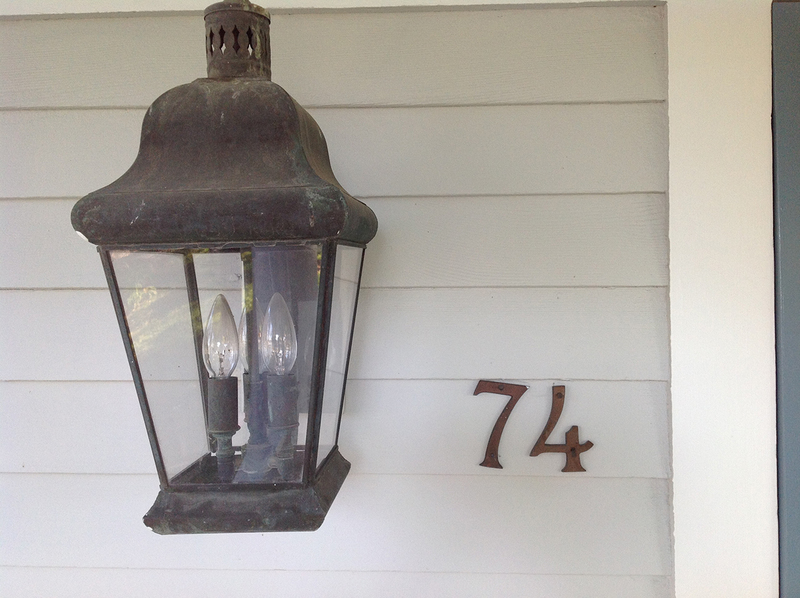 But the library and 74 Rowayton Ave. are still here. The town is more developed than it was. But it’s still here. Time changes much, but traces of the past linger on. Posts tagged Crockett Johnson, Ruth Krauss, or Maurice Sendak. Credits: first two black-and-white photos from The New Haven Register, 1959; third black-and-white photo courtesy of the Rowayton Historical Society; all color photos taken by Philip Nel. Richard McGuire’s “Here” appeared in RAW 2.1 (1989) and is © Richard McGuire. 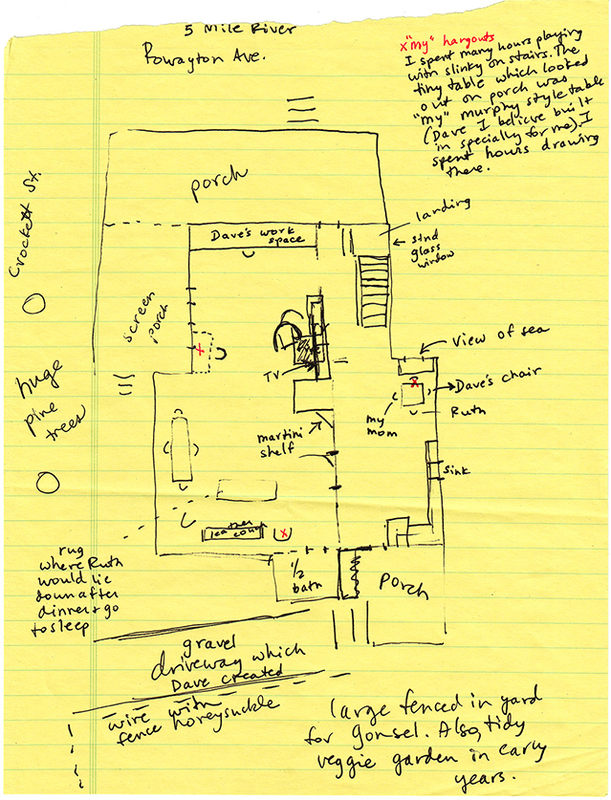 Nina Stagakis’ sketch of the 74 Rowayton Ave. floor plan — published here for the first time — is © Nina Stagakis. Thanks to Gil and Kim Kernan for their hospitality, and to Wendell Livingston and Chris Penberthy (of the Rowayton Historical Society) for inviting me. Finally, special thanks to the University of Connecticut (especially Terri Goldich and Kate Capshaw) for underwriting both the Rowayton Historical Society talk and my University of Connecticut talk, earlier last week. Update, 8:45 pm: Thanks to Wendell Livingston, I’ve replaced my photo of a photo with a scan of the original photo (of the 1958 National Library Week event). Update, 6 Feb. 2018: Thanks to his son Jeff Gross, we can now identify Leonard Gross (whose God and Freud had just been published at the time of this event)!